All photos by Daniel Ellis. Lawson rises to the moniker of “home cook,” rather than reducing herself to it. She tells Good Food host Evan Kleiman that being a woman who enjoys cooking isn’t something to apologize for. Moreover, Lawson says denigrating home cooking because it has historically been done by women is actually “anti-feminist.” Instead, creating delicious food that helps sustain life is a fundamentally creative enterprise that keeps the planet well fed and spinning. When Lawson was writing her latest cookbook, “At My Table: A Celebration of Home Cooking,” she wanted to capture that joy and sense of self she found at home when whipping up meals for loved ones. Some of the book’s recipes are more challenging than others, but all are full of flavor and approachable for those of us who don’t have access to a professional kitchen. One of them is her “Chicken and pea traybake,” which features eight ingredients yet can feed a family. It requires minimal effort and yields maximum flavor. Prepare the tray: Preheat the oven to 400°F and clatter the frozen peas into a large roasting pan, followed by the leeks, garlic, vermouth, 2 tablespoons of oil, 2 teaspoons of salt, and most of the dill. Turn everything together in the pan – breaking up any large clumps of the frozen peas – until well mixed. I advise you to wear CSI gloves for this, just to stop you getting frostbite, though you still will feel the cold. 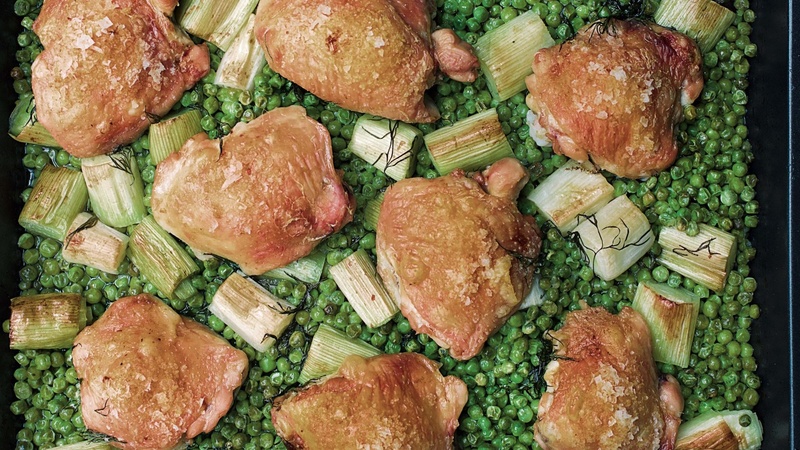 Roast chicken thighs: Arrange the chicken thighs, skin-side up, on top, then drizzle them with a little olive oil and give them a good sprinkling of salt, before roasting in the oven for 45 minutes. Attend to peas: Remove from the oven, give the peas a small stir or tamp down, so that the few that are sitting on the surface and drying out a little are submerged in the liquid. Don’t do the same to the leeks, however, as the bits that are peeking out will become desirably caramelized in the heat. Put back in the oven for a further 30 minutes, by which time the peas and leeks will be soft, and the chicken tender and cooked through, its skin golden and crisp. Garnish and serve: Tear off the remaining dill fronds, and scatter over the top on serving, perhaps with some simply steamed baby potatoes to soak up the pea and chicken juices.